This special lecture day will take place in the Grade 1 Listed Building at Impington Village College – the only public commission in the UK by Gropius. Walter Gropius (1883 –1969), Architect and founder of The Bauhaus School, is widely regarded as one of the pioneering masters of modern architecture. 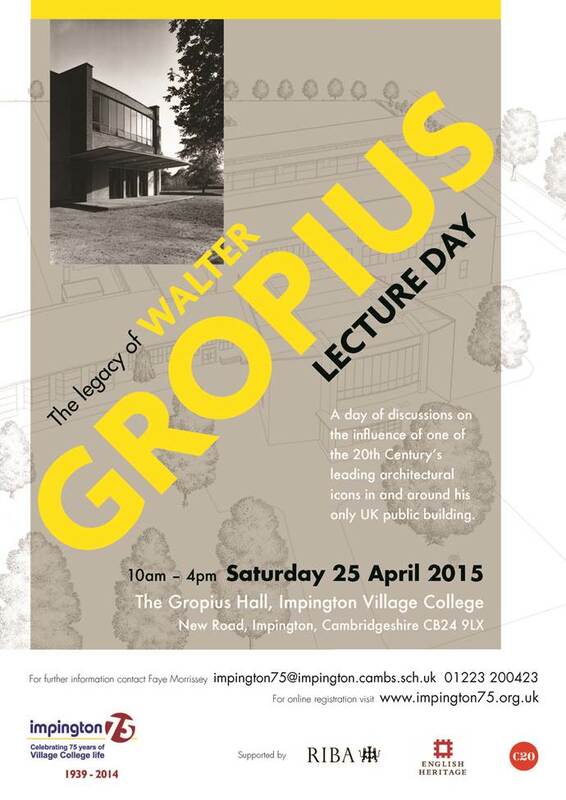 The lecture day will bring together experts from different fields to discuss the influence of Gropius’ work at Impington and how his work which penetrated the wider world is still significant today. There will be presentations on the built environment in the 1930s, conservation principles and the impact of modernist architecture on practice today. Speakers include leading Architectural Historian Dr Alan Powers, English Heritage and RIBA Architects. There will include a tour of the building, an introduction about Henry Morris and panel discussion. Please find attached a flyer with further information including full programme.